I know that the Kansas City, which is home to the Chiefs, is in Missouri and not Kansas, but in their 27 point loss to the Chiefs, the New England Patriots played like something out of the “Wizard of Oz;” without brains, heart, or courage. 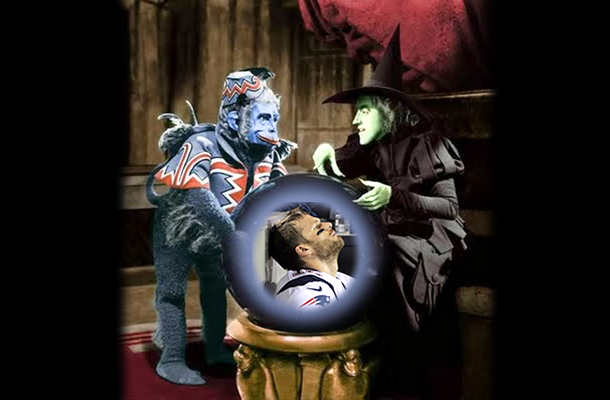 Perhaps worst of all, Bill Bilichick and his coaching staff seemed about as ineffective as the title character in the Judy Garland movie classic, and that my friends, is scarier than a flock of flying monkeys. It seems fairly obvious to most of Patriots Nation that Tom Brady’s heart is not into this season in the way it has been in the past. The assumption by many is that the release of his pal and protector, Logan Mankins, was the last straw. Under Belichick, the emphasis has always been on”value”, which is essentially code for “keep it cheap.” You have to believe that after structuring his contract so consistently in a team friendly manner, Brady is tired of watching the Pats pocket the money instead of keeping talent around him. At 37, he no longer has the time to wait two or three years for youngsters to develop around him. I never thought I’d say this, but for the first I’m beginning to believe that if their approach doesn’t change soon–as in overnight–he’s likely to finish his career somewhere else. In the meantime, let’s hope that the return from suspensions of Brandon Browner on defense and Brian Tyms on offense, will provide both of those units with some much needed heart, as they face the undefeated Bengals. The defense particularly, displayed little of it Monday, as the Chiefs rolled up over 440 total yards, with most of that coming in the first half.